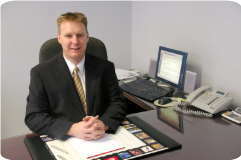 Tim Millard commenced employment with the practice in September 1990 and was admitted as a partner to the firm in July 1997. During this time Tim has made a significant contribution to the growth and success of Berger Piepers Chartered Accountants. His clientele cover a wide range of industries and extend from the Nepean and Sydney Metropolitan regions, to throughout New South Wales and Queensland. Tim specialises in servicing small to medium enterprises enabling them to grow and develop and achieve their business and financial goals. He assists his clientele in achieving their objectives through the extensive skills Tim has developed in the areas of – business management and structuring, business growth strategies, effective taxation planning, financial and regular reporting, creating and establishing internal and external reporting systems and the many other services that the firm offers.